This special tape is an easy to use, an inexpensive way to waterproof and beautify the caulk joints in the bathroom. 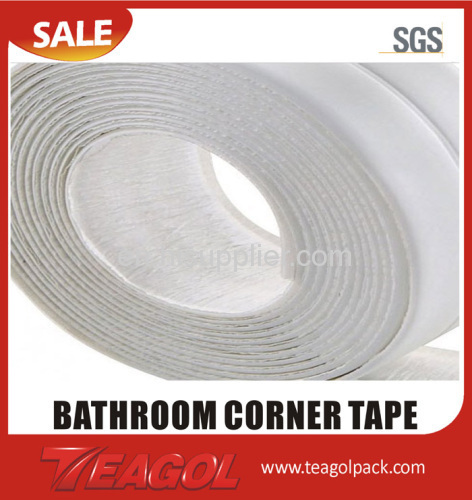 One-side adhesive tape recommended for decorative sealing of washbasins, bathtubs, gullets and cabin edges. This flexible plastic trim is an excellent solution to protect new and existing installations against water. It provides attractive professional finish that covers the unsightly gap between tub and wall. While the adhesive backing ensures excellent adhesion. It works like bathroom caulk, but faster, easier, and without the mess. Just press the self-stick flexible vinyl tape around the base of your toilet, tub, or sink. Protects for years. -Adhesive-backed, pre-shaped flexible trim for a mildew resistant, watertight seal, Long-lasting. -Perfect for most caulking applications, typically used for bathtub. -Fast, easy to install and Easy to clean. Perfect adhesion. -Excellent for watertight sealing of washbasins, bathtubs, gullets and cabin edges. -Excellent for caulking of kitchen and bathroom wall and worktop areas. -Application surfaces should be clean, dry, and free from contaminants such as dust, rust, oil, soap, mould or old sealants. -Measure and cut the required length of the tape. -Bend the tape at a 90º C angle, remove protective paper, adhere the tape precisely onto the joint between two surfaces and press hard. -Protect the tape from contact with water for 24 hours. -Warranted shelf life is 12 months from the manufacturing date when stored in original packaging in a dry and cool place.